Do you stand in front of your wardrobe, doors open, frowning at the contents? You do? Well, take heart. You’re not the only one. Over the last six months or so, I’ve been working on reducing the clutter in my life. My closet is just one area in which it seems I have a problem letting go. I often wonder if this resistance is rooted in a fear of lack or becoming too sentimental about objects that no longer serve me. I’ve spoken about this before and the fact I’m back here again speaks volumes about the real challenge of minimalising your belongings. It’s definitely a process you need to work through and, it takes time. I had another run at my closet on the weekend and managed to throw out a heap of stuff. I’m definitely getting closer to the ideal of a 10 item wardrobe. Plus, I also repaired a couple of pairs of pants that have been collecting dust for a while. I’m kind of amazed I still remember how to thread the sewing machine! This one really should be a no-brainer but… I had several T-shirts that were worn to the point of no return. They were super comfy but had to go. It might not be damaged beyond repair but it’s time for a reality check. If it’s broken and you haven’t repaired it by now, and you’re not going to repair it today… it’s time for it to go. When I started the process of clearing out my closet a few months ago, I created a Limbo Box. This is where I’ve put the clothes I still love and are in excellent condition but don’t fit (stress and sleeplessness can wreak havoc on your waistline). I’ll revisit the Limbo Box after 12 months. If I can’t fit into that gear by then, I’ll have to either try to sell the contents or donate it. This time around, I didn’t add anything to the Limbo Box. I have very small feet so I don’t tend to have an over-supply of shoes in my closet however, I still found a couple of pairs that have outlived their fashion value and general usefulness. They were still in good condition so rather than throw them out, I put them into the bag for donating to one of the local charity stores. Like shopping bags, shoe boxes have a way of hanging around long after their usefulness has ended. If you don’t store your shoes in the box they came in, then they’ve served their purpose and need to go. Yes. Cosmetics have expiry dates, too. Check them out here. Even if your make-up hasn’t expired, if it causes an adverse reaction on your skin or makes your eyes irritated, throw it out. I know, if you hang onto clothing long enough, it’ll come back into fashion. Flares and – the bane of short waisted girls everywhere – high waisted jeans and pants. Unless you plan on using your wardrobe to open a fashion museum one day, it’s time to get rid of the jackets with huge shoulder pads and any outfit inspired by Clueless . 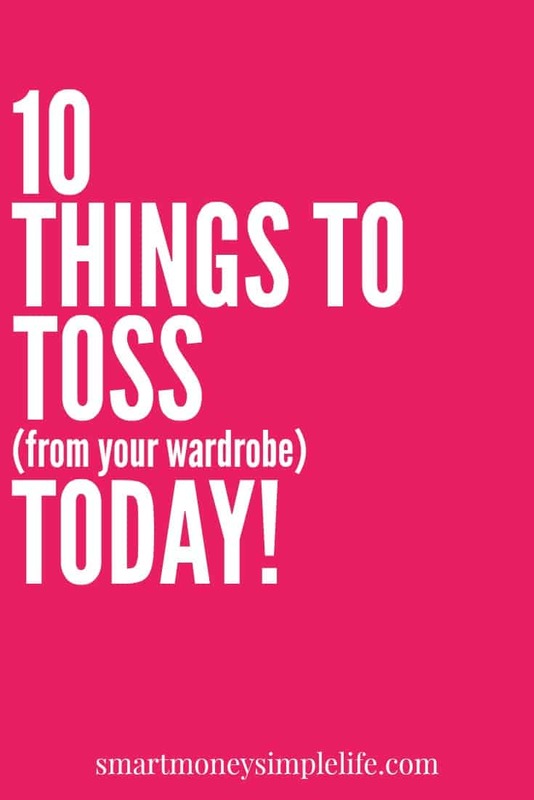 I don’t know the actual statistics, but my guess is that half the gym clothes ever purchased end up stuffed into a dark corner of a wardrobe, worn once, maybe twice, and never seen again. If you’ve got sad, ignored gym clothes in your wardrobe, drag them into the light of day and be honest with yourself. Will you use them for their intended purpose? Can you wear them around the house? Hello, yoga pants! If not, and they’re in good condition, throw them in the ‘donate’ bag. If not, throw them out. I’m guilty of this. I still can’t quite part with my school blazer. I’m not sure why, but it’s something I’m working on. It’s the only sentimental item of clothing left in my wardrobe so I’m not doing too badly. Having said that, I finished high school a long, long time ago. If your old school or college gear is taking up space in your wardrobe, now is a good time to deal with it. And then, promise yourself you’ll never let it get out of control again. 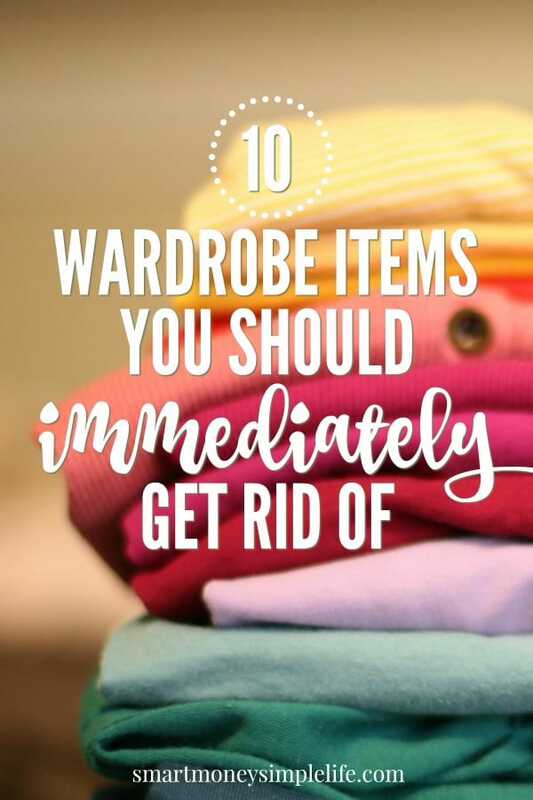 Easier said than done, maybe, but the more you cull from your wardrobe the easier it will be to maintain. The simpler you keep your style, the less clothing you’ll need. The less clothing you need the better quality items you’ll be able to afford. The more care you take in choosing your wardrobe items, the less likelihood there is there’ll be pieces hanging around that never get worn. There are no downsides to getting rid of stuff you don’t need! P.S. Remember to follow Clearing the Clutter on Pinterest for a library full of awesome de-cluttering ideas. One year I got robbed of everything, including underwear. The only sentimental item I had then was my cheerleader outfit and I still hate that it got stolen. Every other item of clothing was replaceable. It is hard parting with sentimental items. I can honestly say that everything in my wardrobe fits, is in good repair and is worn now though. After having to replace my entire wardrobe I only bought items I love. I can’t imagine being robbed of everything. It must have been a shocking experience. But, it sounds like you used the opportunity to start again very wisely. Well I’m not sure about the work out clothes but I do agree with the rest of the list. I do at least 2 loads a week that are almost all work out clothes. But we are in the military and working out I’d a part of our daily life. The general rule of thumb is stuff that you haven’t worn in the last 6 months-1 year or worn out. I disagree with “outdated fashion”, it does always come back in (especially different cuts and type of jeans). If you like it, wear it. I also disagree with the workout clothes. Track/yoga pants are great to wear around the house or just use as PJs. Track pants come out when I have heavy cleaning to do or when I paint, better than damaging a more expensive item. In Canada we have to pay for bags most of the time. So instead of just pitching mine in the garbage, I donate them to the food bank so they can pack food in them. Usually they are in need of bags as well. Hi, just an FYI about shoeboxes: you can donate those to your local animal shelter. Cats, kittens, and other small animals use them. That is a brilliant idea. Great option for towels, blankets, etc., that aren’t good enough for donating to a thrift store. I’m sure all those critters would enjoy some comfy bedding, too.